This is a big day for winning free travel. We have 4 promotions offering a total of 107,500 AAdvantage Miles, plus a fifth promotion offering a trip to attend premier of the new movie: Bourne Legacy. The Frugal Travel Guy and the DeAAl of the Day. Rick and his wife just returned home after travels in Spain, Italy, and Tunis. Go here to read their trip report and then to welcome them back and post your best DeAAl of the Day offer for a chance to win some miles. Points, Miles, and Martinis will be launching a new promotion today. Miles and Martinis is excited to partially reveal the BEST TRAVEL DEAL EVER, an exciting new giveaway that gives PMM readers a chance to WIN lots of free American Airlines miles. I’m not certain when it will go live, so keep an eye on the home page throughout the day. Whether you’re a seasoned traveler or an agent on the run, you know how important it is to pack appropriately for any destination. Show us your packing skills, and you’ll be entered for a chance to win a trip to attend the U.S. 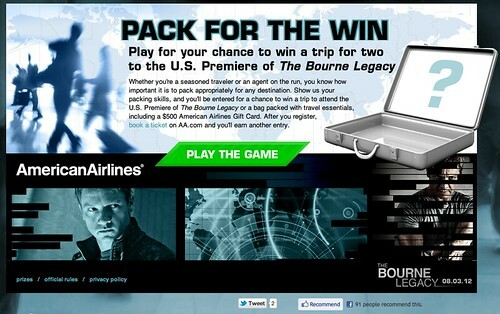 Premiere of The Bourne Legacy or a bag packed with travel essentials, including a $500 American Airlines Gift Card. It’s pretty easy. You’re given a scenario or destination and several items which you can choose to pack. 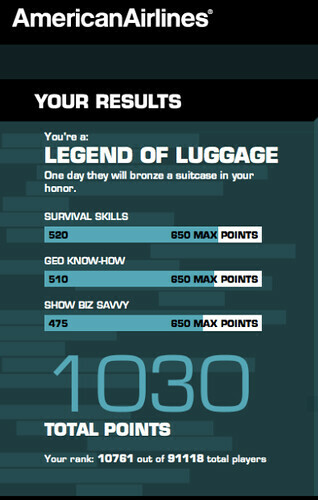 You’re awarded points for packing the most useful items and for completing the task quickly. I did okay, but nothing to brag about. Round-trip air travel for the winner and a guest from any U.S. city serviced by American Airlines or one of their partners to the location of the movie premier. After you arrive in the destination city, round-trip transportation between the airport and hotel will be provided. Each winner and guest receive a one-room, 3 night hotel stay at a 4-star hotel. Transportation to and from the movie premier. 2 tickets to attend the premier of the Bourne Legacy. The total ARV of the Grand Prize including airfare, lodging, ground transportation and premiere tickets is $ $4,982. one (1) package including pajamas, amenity kit and neck pillow with an ARV of $100. The total ARV of the each First Place Prize is $1528.91. All entries must be received by 11:59 a.m. CDT on June 28, 2012. Go here to enter and for complete details. This is really easy to play. Just name four people you’d like to take on a trip with you. If you’re one of those that like to avoid Facebook promotions, here’s one that you can play. Just click the “skip” button on the same page, and go directly to the sweepstakes submission form. You don’t even have to be logged into Facebook. Grand Prize Winner will receive 100,000 American Airlines AAdvantage miles which may be used for air transportation on American Airlines or its “Airline Associates” (American Eagle, Executive Airlines or the AmericanConnection carrier),oneworld carriers or select AAdvantage participating airlines, car rentals, hotel stays and other awards available at AA.com/redeem, the (“Prize”). We have a winner! I’ll announce their name in a post this afternoon. Movie is going to rock!!! @ Jayson – I”m a big fan of the books and enjoyed the previous Bourne films. I can’t wait to see the new one either! 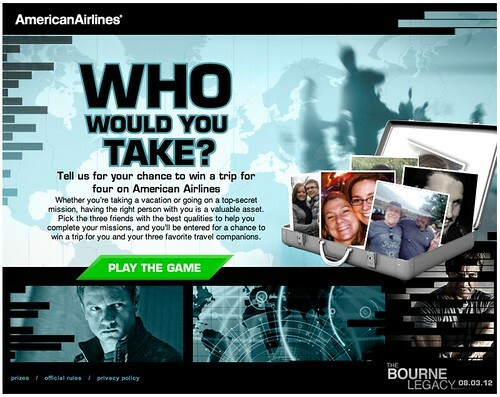 You can also enter the “Bourne” sweepstakes a number of times. I think it stopped me at 5? @ Jeff G – Good to know. Thanks for the info! 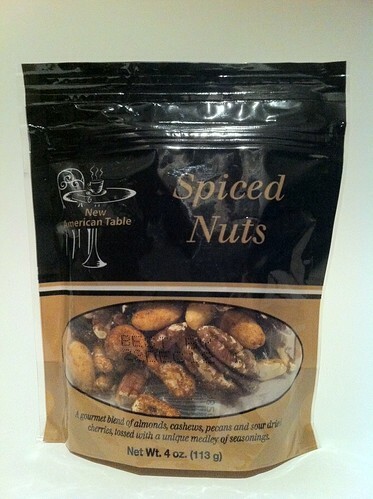 Thanks for the info and id like the spiced nuts.